Buckhingham construction firm secured a £20-million contract to deliver Tottenham stadium's roof. Worth mentioning, the deal doesn't cover all of the roof but only its cladding, which says a lot about the project's value (now estimated between £800-850 million) and scale. The roof's main support structure will be a tensile cable structure, while Buckingham will supply prefabricated cassettes, covering entire segments of the roof with each one. These elements will include Tottenham's Sky Walk, a viewing deck along the southern edge of the stadium, perhaps even longer. It will allow visitors to view the London skyline from the height of some 40 meters. Additionally, a suspended restaurant will also be created, as indicated by some of Tottenham's renderings. "We are commencing offsite manufacture of the roof cassette units that ultimately will be suspended from a cable net structure (constructed by others) early next year." Buckingham spokesperson informed. The time frame is confirmed by Spurs chairman Daniel Levy himself. 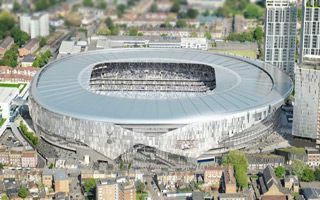 He told the Tottenham Hotspur Supporters' Trust last month that the roof going on at the end of January or early February 2018 would be a big indicator as to whether the project was on schedule. The 61,500-seat stadium should be ready for opening in mid-2018. Until that time Tottenham are expected to play all games at Wembley.